This recipe for sweet and sour sauce from scratch is worth it's weight in gold. Unbelievable flavor and no chemicals or preservatives. Offering the best homemade condiments too. After heating the oil over medium heat in a saucepan, add the onion and cook for approximately 2 minutes. Add the ginger and cook for 30 seconds. Stir in the pineapple, ketchup, white sugar, vinegar, garlic sauce and simmer for 3-5 minutes while stirring. In a small bowl add the chicken broth and cornstarch and whisk until smooth. Add this mixture to the sauce and bring to a boil. Cook for 1-2 minutes, remove for the heat and cool slightly. Pour this into a blender or food processor and pulse a few times. Leave some of this sauce chunky if desired. Serve warm. 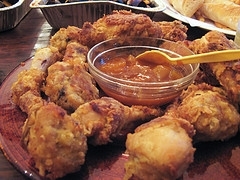 I was thinking of this recipe when posting my recipe for sweet and sour sauce. You may also substitute chicken for this recipe. It's delicious. PREHEAT oven to 400 degrees. Season and bake ribs for 30 minutes to brown. Drain fat. Cover with the sauce and bake another hour at 350 degrees; basting occasionally. Ribs should be cut in individual pieces before serving. Drain syrup from the pineapple and add enough water to make 1-1/2 cups liquid. Add vinegar, sugar, salt, soy sauce and cornstarch. Cook until slightly clear and thickened. Add to meat and cook covered for 1 hour. Add pineapple chunks, green pepper and onion. Cook for 15 minutes longer.